Patience is repaying Michael Hendry - New Zealand's new No 1 men's golfer. 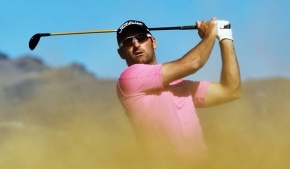 On the eve of this week's NZ PGA Championship title defence at The Hills in Queenstown, the latest official world golf rankings have installed Hendry, 33, as the top-ranked Kiwi for the first time. He is also preparing for the biggest tournament of his career, next month's second World Golf Championship stage in Doral, Miami, where the Aucklander will line up against the world's top 50 players, including Rory McIlroy and Tiger Woods, on one of the most iconic courses in the world - TPC Blue Monster. How things can change. Five months ago, Hendry's frustration was reaching breaking point. "The beginning of 2012 was fantastic with a win at the New Zealand PGA in April, I played pretty good early in the year, but the middle was pretty tough, to be honest. I didn't make another cut until August. "I was working so hard and getting no results for it. It was frustrating. I was wondering whether it was time to hang the boots up. "Thankfully I saw a bit of light at the end of the tunnel, at the Wanganui Pro-Am, of all places, before heading out to the Japanese Q-School first stage, which I'd considered pulling out of because of the way I was playing. "I ended up playing some of the best golf of my life and secured a Japanese Tour card for this year. The confidence started to grow and from there I've gone from strength to strength. "I've really tried to do a lot of work with my sport psychologist to give myself a break, mentally. That's what got me over the hurdle. "I needed to relax more and stop being so hard on myself, that's been the catalyst." With 2005 US Open and world matchplay champion Michael Campbell consistently back on the first page of European Tour leaderboards, the fact Hendry has surpassed him in the world rankings is testament to his consistency. After three impressive top-seven finishes in Australia at the end of 2012, where he acquitted himself well against established PGA Tour stars Bo Van Pelt and Jason Dufner, Hendry has begun the new year admirably. Fourth in last month's season opener, the Heritage Classic, Hendry was runner-up at last week's Queensland PGA Championship and heads to The Hills as a favourite. "It meant a lot to win the NZ PGA last year, I'm part of New Zealand's golfing history now. "One of my biggest goals is to be able to look back on my career and be considered one of the best players New Zealand has produced. To do that you have to be the national No 1, which I've now done. That's a significant goal achieved and I'm very proud. "You also need to win your national titles like the NZ PGA. It's a tournament I really enjoyed last year. I had a great time playing with Don Cheadle, I've seen his movies and that's the beauty of Pro-Ams, you get to meet people you wouldn't ordinarily." Hendry acknowledges the biggest tournament of his career lurks a couple of weeks away in America. However, the new-found perspective which has helped his career thrive over recent months is helping him stay grounded. "The Cadillac Championship will be my biggest event so far, no doubt about it," he said. "But I'm preparing for it as I would for any other event. If I start giving it special treatment, that's when I risk losing perspective and start slipping back into that old frame of mind. "It's an important couple of weeks ahead with that and the NZ PGA, but being New Zealand No 1, things are off to a good start." Landmarks: NZ No 1 (Feb 2013), Japanese Tour card (2013), NZ PGA champion (2012), Indonesian Open champion (2010).